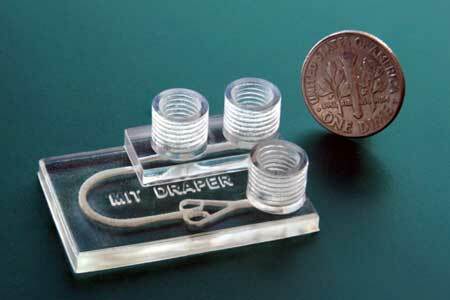 (Nanowerk News) MIT researchers have 3-D printed a novel microfluidic device that simulates cancer treatments on biopsied tumor tissue, so clinicians can better examine how individual patients will respond to different therapeutics — before administering a single dose. Testing cancer treatments today relies mostly on trial and error; patients may undergo multiple time-consuming and hard-to-tolerate therapies in pursuit of one that works. Recent innovations in pharmaceutical development involve growing artificial tumors to test drugs on specific cancer types. But these models take weeks to grow and don’t account for an individual patient’s biological makeup, which can affect treatment efficacy. The researchers’ device, which can be printed in about one hour, is a chip slightly larger than a quarter, with three cylindrical “chimneys” rising from the surface. These are ports used to input and drain fluids, as well as remove unwanted air bubbles. Biopsied tumor fragments are placed in a chamber connected to a network of channels that deliver fluids — containing, for instance, immunotherapy agents or immune cells — to the tissue. Clinicians can then use various imaging techniques to see how the tissue responds to the drugs. A key feature was using a new biocompatible resin — traditionally used for dental applications — that can support long-term survival of biopsied tissue. Although previous 3-D-printed microfluidics have held promise for drug testing, chemicals in their resin usually kill cells quickly. The researchers captured fluorescence microscopy images that show their device, called a tumor analysis platform (TAP), kept more than 90 percent of the tumor tissue alive for at least 72 hours, and potentially much longer. Because the 3-D printed device is easy and cheap to fabricate, it could be rapidly implemented into clinical settings, the researchers say. Doctors could, for instance, print out a multiplexed device that could support multiple tumor samples in parallel, to enable modeling of the interactions between tumor fragments and many different drugs, simultaneously, for a single patient. A promising application is testing immunotherapy, a new treatment method using certain drugs to rev up a patient’s immune system to help it fight cancer. (This year’s Nobel Prize in physiology or medicine was awarded to two immunotherapy researchers who designed drugs that block certain proteins from preventing the immune system from attacking cancer cells.) The researchers’ device could help doctors better identify treatments to which an individual is likely to respond. “Immunotherapy treatments have been specifically developed to target molecular markers found on the surface of cancer cells. This helps to ensure that the treatment elicits an attack on the cancer directly while limiting negative impacts on healthy tissue. However, every individual’s cancer expresses a unique array of surface molecules — as such, it can be difficult to predict who will respond to which treatment. Our device uses the actual tissue of the person, so is a perfect fit for immunotherapy,” says first author Ashley Beckwith SM ’18, a graduate researcher in Velásquez-García’s research group. Co-author on the paper is Jeffrey T. Borenstein, a researcher at Draper. Microfluidics devices are traditionally manufactured via micromolding, using a rubberlike material called polydimethylsiloxane (PDMS). This technique, however, was not suitable for creating the three-dimensional network of features — such as carefully sized fluid channels — that mimic cancer treatments on living cells. Instead, the researchers turned to 3-D printing to craft a fine-featured device “monolithically” — meaning printing an object all in one go, without the need to assemble separate parts. The heart of the device is its resin. After experimenting with numerous resins over several months, the researchers landed finally on Pro3dure GR-10, which is primarily used to make mouthguards that protect against teeth grinding. The material is nearly as transparent as glass, has barely any surface defects, and can be printed in very high resolution. And, importantly, as the researchers determined, it does not negatively impact cell survival. Two other key innovations on the device are the “bubble trap” and a “tumor trap.” Flowing fluids into such a device creates bubbles that can disrupt the experiment or burst, releasing air that destroys tumor tissue. To fix that, the researchers created a bubble trap, a stout “chimney” rising from the fluid channel into a threaded port through which air escapes. Fluid — including various media, fluorescent markers, or lymphocytes — gets injected into an inlet port adjacent to the trap. The fluid enters through the inlet port and flows past the trap, where any bubbles in the fluid rise up through the threaded port and out of the device. Fluid is then routed around a small U-turn into the tumor’s chamber, where it flows through and around the tumor fragment. This tumor-trapping chamber sits at the intersection of the larger inlet channel and four smaller outlet channels. Tumor fragments, less than 1 millimeter across, are injected into the inlet channel via the bubble trap, which helps remove bubbles introduced when loading. As fluid flows through the device from the inlet port, the tumor is guided downstream to the tumor trap, where the fragment gets caught. The fluid continues traveling along the outlet channels, which are too small for the tumor to fit inside, and drains out of the device. A continuous flow of fluids keeps the tumor fragment in place and constantly replenishes nutrients for the cells. “Because our device is 3-D printed, we were able to make the geometries we wanted, in the materials we wanted, to achieve the performance we wanted, instead of compromising between what was designed and what could be implemented — which typically happens when using standard microfabrication,” Velásquez-García says. He adds that 3-D printing may soon become the mainstream manufacturing technique for microfluidics and other microsystems that require complex designs. In this experiment, the researchers showed they could keep a tumor fragment alive and monitor the tissue viability in real-time with fluorescent markers that make the tissue glow. Next, the researchers aim to test how the tumor fragments respond to real therapeutics.